S. Gupta, A. Ma, A. Hartmaier. 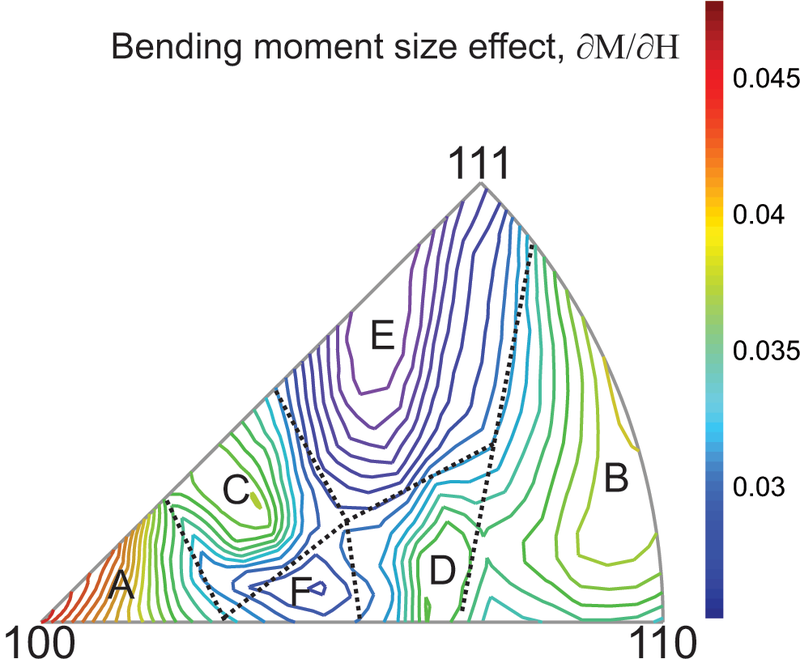 Graphic reprinted from Computational Materials Science, 101, Satyapriya Gupta, Anxin Ma, Alexander Hartmaier, Investigating the influence of crystal orientation on bending size effect of single crystal beams, 201-210, © 2015 with permission from Elsevier. Influence of crystal orientation on bending size effect has been numerically investigated for single crystal beams. This work is inspired by the experimental observations of Hayashi et al. (2011), where they observed a significant difference in bending size effect for two different crystal orientations. We have used a higher order non-local crystal plasticity model which can account for different hardening contributions by SSDs (statistically stored dislocations) and GNDs (geometrically necessary dislocations) simultaneously. It was found that strain hardening together with an additional kinematic hardening caused by accumulation of GNDs and the number of activated slip systems can be seen as the origin of the orientation dependence of bending size effect. We have also observed a pronounced orientation dependence of spring back size effect, which can be explained on the basis of number of the activated slip systems and equivalent plastic strain. Simulation results showing enhanced or diminished bending size effect for different crystal orientations reveal the importance of crystal orientation for precise micro-bending operations.